What is the Linksys WRT54G2? 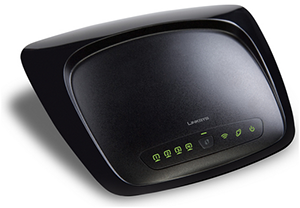 The Linksys WRT54G2 Wireless-G Broadband Router lets you access the Internet via wireless or wired connection through one of its four Ethernet ports. You can also use it to share network resources such as computers, printers and files. Network Address Translation (NAT) technology, which enhances network protection by allowing your computers to share Internet access through a single, public Internet IP address. NOTE: For more details about this product, visit the Linksys Support Site and browse for more troubleshooting articles, downloadable user guides or firmware updates and other support information. These numbered LEDs, corresponding with the numbered ports on the router’s back panel, serve two (2) purposes. The LED is continuously lit when a device is connected to the port. It flashes to indicate network activity over that port. If you have client devices, such as wireless adapters, that support WPS, you can use the WPS button to automatically configure wireless security for your wireless network(s). The LED flashes amber when a WPS session is active. It flashes green for two (2) minutes during the WPS process and goes steady when the setup process is successful. The LED lights up amber if there is an error during the WPS process. The Wireless LED lights up when the wireless feature is enabled. It flashes when the Linksys WRT54G2 sends or receives data over the wireless network. The Internet LED lights up when there is a connection made through the Internet port. It flashes to indicate network activity over the Internet port. The Power LED lights up when the Linksys WRT54G2 is powered ON. The LED flashes when the router goes through its self-diagnostic mode during boot-up. When the diagnostic is complete, the LED is continuously lit. The Internet port is where you connect the network (Ethernet) cable from your Internet Service Provider (ISP), which typically comes from a Cable or Digital Subscriber Line (DSL) modem. In most cases you will be connecting one end of the network cable to the Ethernet port on your cable or DSL modem and the other end to the Internet port on your Linksys WRT54G2. Using network cables, these Ethernet ports (4, 3, 2, 1) connect the router to computers or other devices on your wired network that have Ethernet ports such as gaming consoles, HDTVs, Blu-ray Disc™ players, or printers. There are two (2) ways to reset the Linksys WRT54G2 to its factory defaults. Either press and hold the Reset button for approximately 10 seconds, or restore the defaults from the Administration > Factory Defaults tab on the router’s web-based setup page. The Power port is where you connect the power adapter. Just unplug the power adapter to power OFF the device.